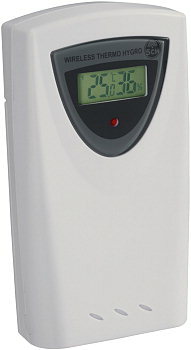 One my search for a easy to install, easy to use and inexpensive way to understand the climate condition in my house I deceided to buy a wireless 433 MHz weather station from Conrad which is originally from Honeywell. 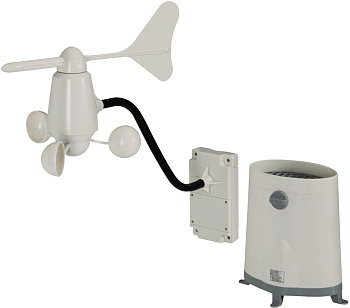 Up to 5 wireless temperature & humidity sensors, one outside remote anemometer, and one outside remote rain gauge collect data which is send via USB to a java-program to the PC. This booklet gives a nice overview of the weather stations function. 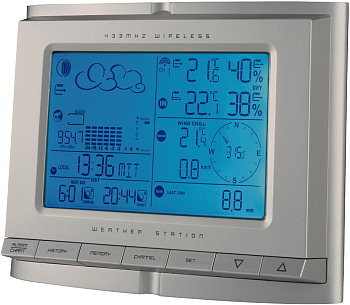 The full documentation and the software is available on the German Conrad product page „Funk-Wetterstation TE831X„. The included software allows to view all information similar to the weather station itself on your PC screen. You can set up how often data should be stored and transmitted to the PC from 5 minute to 1 day intervall. The data is logged in two files in the program folder RECORDS.TXT and RAINBASE.DAT. The weather station PC software is written mostly in java. Only the access to the USB-interface comes with a windows DLL and the start of the application uses a windows EXE. Adding the prefix in_ in front of a variable gives you all values in SI-units except windSpeed in knots. Without the prefix the values are stored according to your installation set-up for units. The init-method is called form the Constructor and the update follows each data collection cycle. Just download the full java-file. You can access all feeds with the typical pachube feed interface.